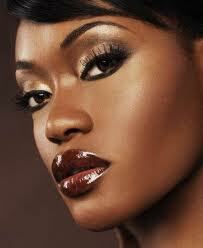 A dark-skinned woman with full lips has to wear the right shade of lipstick or she looks foolish. My brown skin (with reddish tones) and dark heart-shaped lips limit my range of wearable colors to rich berries, bronzes and chocolates. I can’t sport a true read, or all you will see is lips. Now don’t get me wrong, love the lips, would not trade them in for another pair but I have to dress them right. Lately, searching for appropriate colors has been difficult. A sista has looked high and low, dipping in to drug stores and feverishly flipping through the Mary Kay catalogs for lipstick. Out of frustration, I usually settle on the darkest colors I can find (dark for light complexions) then blend them with my chocolate lip liner for a decent look. My money is green and it spends just fine, as a consumer I should have an array of colors that fit me without searching through kingdom come to find them. According to the Essence Smart Beauty Survey, African-American women spend $7.5 Billion on cosmetics with little satisfaction. I’m not sure what is happening in the retail market but a few years back, it wasn’t as difficult to find colors. I recall seeing more lines available in my local stores like Black Opal that make cosmetics for people like me. Now finding those lines in my area are impossible, I’m wondering if the bigger brands with African-American spokeswomen have strong armed the retailers to push out the little guys? Just a thought. The bigger brands are using Queen Latifah and Beyoncé to draw African-American consumers but are not creating enough products to match our various hues. I must admit that I am feeling discriminated against, or at least ignored. Fortunately, just last week, I saw an online ad for Black Opal. It never occurred to me to look online because I like to see the makeup in the store before buying. I checked for local stores selling it and was happy to find a drug store near my church that carried the shades I needed. Though I finally found some lipstick, I still think the big retailers should carry more choices for women of color. Is it foolish to think that our $7.5 Billion should carry some weight and have influence on product releases? No, absolutely not, but the manufactures do not care about our needs because we are giving them our money freely for products that do not work for us. Together we can make a difference by spending our money on products like Black Opal, Iman and Black Radiance, lines that cater to our needs, instead of throwing money away on a hope that the product will work. I’m not saying these lines will solve all of our cosmetics problems but at least they cared enough to make something for us. I know it may not be convenient but try your best to hold out until you find something that is designed with you in mind before spending your money; it is time for us to be taken seriously. If you have make up favorites and know of lines for women of color, please comment and share. I am a writer - on Chapter 2.